Queen Min was 15 years old when she married King Gojong. They were not in love. Not many 15 year olds are, really. For Gojong, it was stressful enough being the King; he didn’t dig it when Min stayed in her chambers while he drank the night away in his court. The two of them lived in Gyeonbokgung Palace, which today is one of Korea’s biggest tourist attractions. I spent a day there with Dana, which I’ll discuss later. For now, let’s try to stay focused on Queen Min and King Gojong. Teenagers fall in and out of love, like someone who’s lovesick falls in and out of dreams and fantasies; Min and Gojong were out of love more than they were in it. Adults, though, have different reasons for falling in love, and by the time they had reached adulthood, Min and Gojong had deep affection each other. He admired her intelligence, her strength, and the enormous role she had taken in her country’s politics. They spent days and nights at the palace, falling further in love with each other. If you’ve seen Gyeonbokgung Palace, you can probably understand how this could happen. It’s a fairly romantic place. Had the two of them been given, say, my apartment to live in, perhaps falling in love would’ve been a bit more difficult. Dana and I didn’t know anything about Queen Min and King Gojong when we spent a Sunday afternoon together at the palace. She was a girl I’d known for a few weeks. We got along well and could make each other laugh. It was Dana’s idea to go to the palace together. Dana fancied photography, and she snapped picture after picture. She shot pictures of the men outside the palace, dressed traditionally as guards; Korean children running their hands along the bamboo exterior of a wall; a small hut sitting like a duck in the middle of a perfectly round pool of water. She captured that palace and made it look perfect – the colors bright, the clouds still in the blue sky like they were posing for her. That was our Palace Moment. The Queen and the King must’ve had several, too many to count. Two days later Dana went on a date with another guy and spent the night with him. In a week they were dating. I was left to myself. She got to spend her time developing a relationship. I, on the other hand, got to spend my time alone reading about King Gojong on Wikipedia. But being bitter is not the point. Instead the point is simply to say that in every relationship – be it the long ones like Min and Gojong or the short ones like Dana and I – there are Palace Moments. Times when everything is perfect and life seems full of happiness and possibility. The type of day you would put on repeat if you could. I can think of a bunch of Palace Moments I’ve had. They’re important to hold on to. With all of the hurt and the pain that comes with being with someone, it’s nice to know that once, if only for a moment, things were pretty damn good. In October of 1895, Japanese assassins stormed Gyeongbok Palace. They found Queen Min there and killed her. Afterwards they burned her body and spread her ashes in a forest. When the threat had passed, King Gojong returned to the palace where he’d spent thirty years with his wife. He locked himself in his chambers for weeks and ignored his duties as King. Defeated and depressed, he signed treaties with Japan that gave them immense power in Korea. 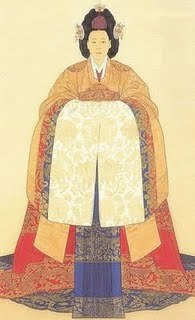 Two years later, King Gojong did what was important to him and had an enormous funeral for his late wife. He borrowed money from Russia and spared no expenses. On that night, the city of Seoul was lit with lanterns, thousands of soldiers marched the street in mourning, and King Gojong revealed a giant wooden horse that he had made for his lovely wife, for her to fly off into the afterlife on.